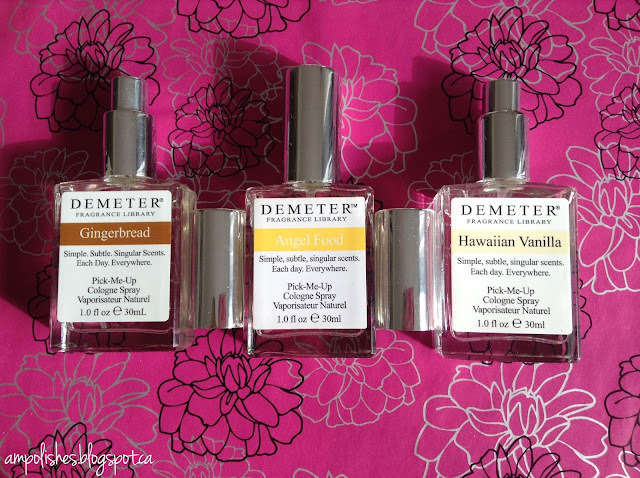 Demeter is a brand that holds nostalgic memories for me, I remember owning the scent "Fuzzy Navel" in high school and using the fruity fragrance on a pretty regular basis. Since my experience with the brand back in high school they have grown to include so many interesting and unique scents like Elvira's Zombie, Clean Windows and Pizza. 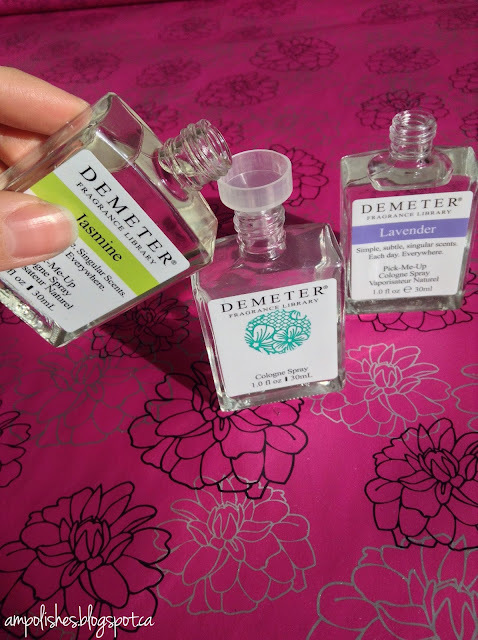 "Demeter was conceived in the East Village of New York City in 1996 a unique point of view about fragrance, a perspective that still remains unique, but that continues to expand. The original mission was to capture the beautiful smells of the garden and nature in wearable form. 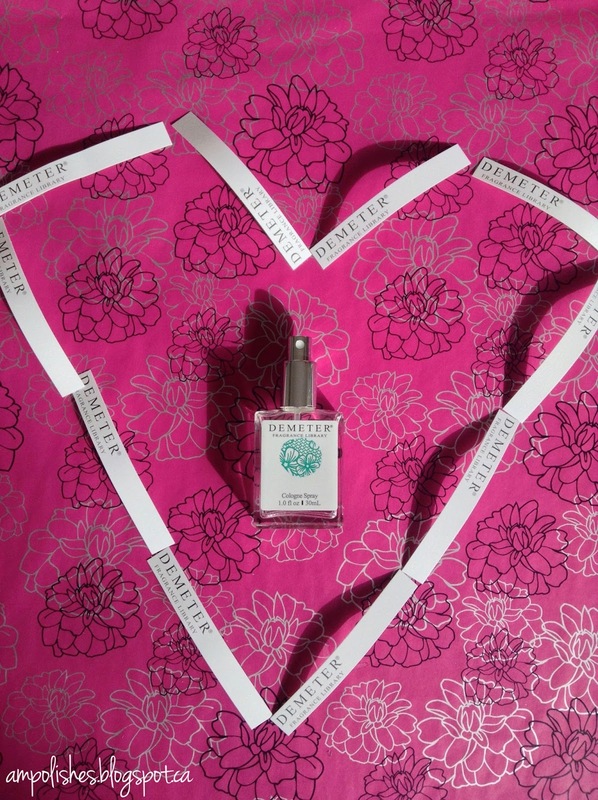 Consistent with that mission we took the Demeter name, inspired by the Greek Goddess of Agriculture. 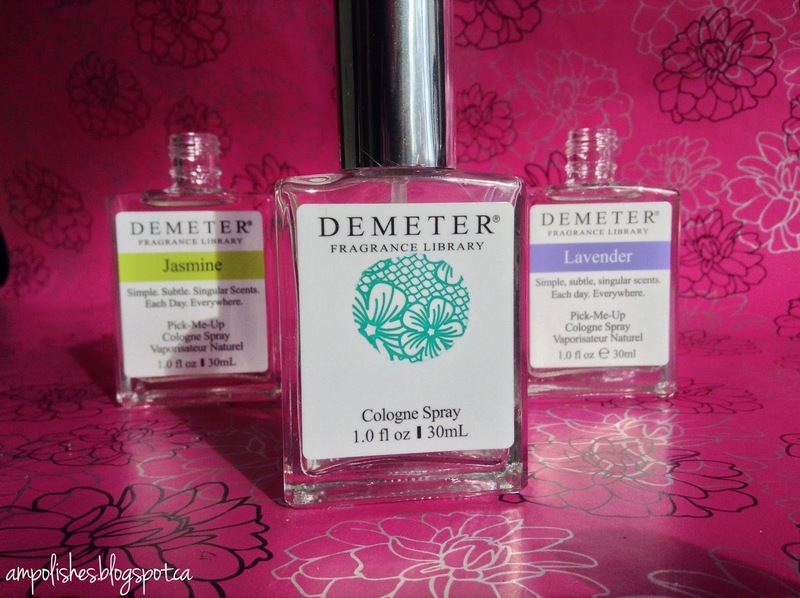 The first three Demeter fragrances, based on that ideal, were Dirt, Grass and Tomato, and were sold in a few stores in NYC." 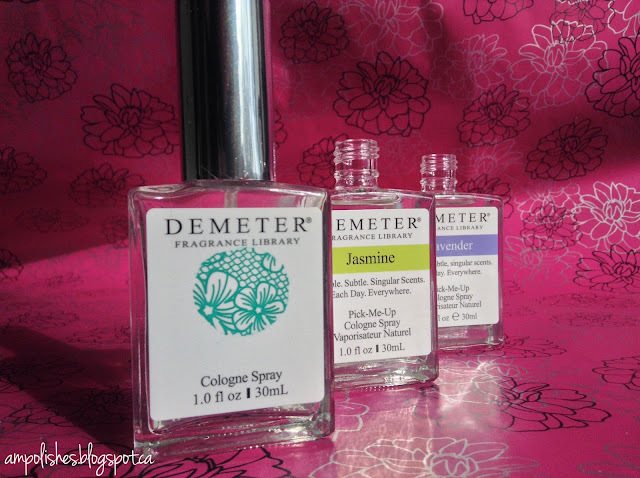 The newest release from Demeter are kits with duo or trio cologne sprays that you can mix and blend to create your very custom scent. 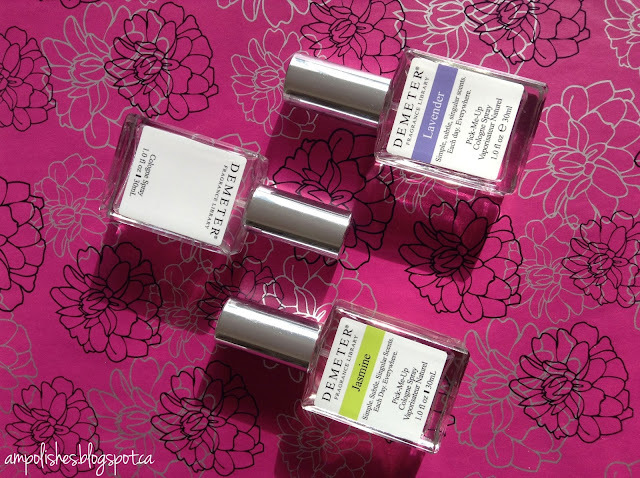 "Each TRIO contains three fragrances with a common theme, that can be combined or blended together in any proportion to create your own scent." All three scents have the base note of vanilla. Vanilla isn't my usual go to fragrance as I find the vanilla scents remind me of sweet food and I'm impartial to smelling like a cupcake. I'm more of a floral gal myself. But I was pleasantly surprised with how accurate these scents smelled. Base note of vanilla with a strong middle note of spice with a top note of creamy/edible. This scent reminded me of Christmas and smelled exactly like delicious gingerbread lattes. My second favourite from the kit. Base note vanilla with a top note of creamy/edible. Your classic straight up vanilla scent. I did find it to have a slight alcohol scent to it when you first spray it but goes away after it settles. Base note of vanilla, a middle scent of light floral and a top note of fruit. I feel like this is how suntanning on a beach in Hawaii while enjoying some sort of pineapple cocktail would smell like. My favourite from the kit. The test strips made it easy to play around and overlap the different scents. The blending can also be done directly on the skin. The vanilla base note kit launched in October 2015. A new FOOLPROOF TRIO will launch online monthly. 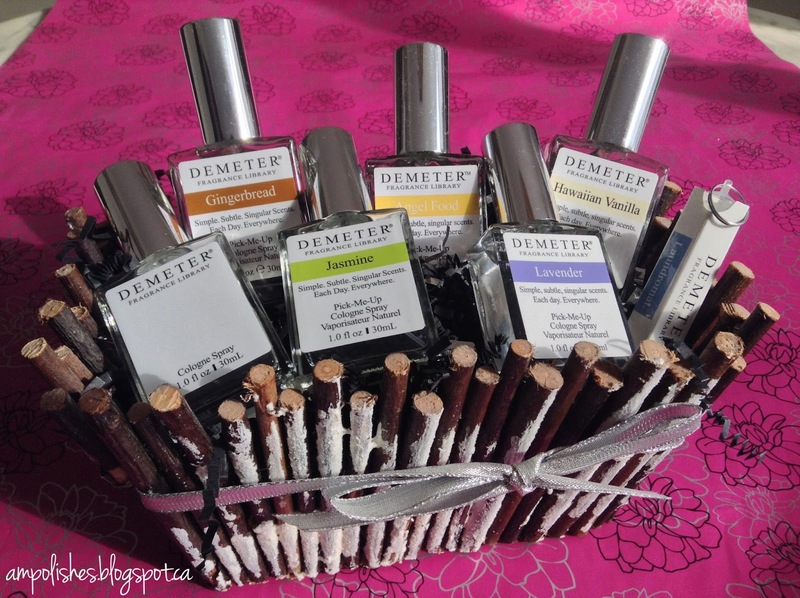 The trio kits are priced at $45 and are available nationwide and on the Demeter website. This smelled sooo nice, just like jasmine flowers. It didn't have that artificial after smell that other jasmine essential oil based perfumes I've smelled had. The scent transports me to a springtime garden in full bloom. I can see myself using this scent on a daily basis. The staying power was amazing too. I sprayed this on my sweater before work and 7 hours later the scent still lingered, unchanged. I thought this scent accurately like lavender but not too intense. Just like the jasmine scent, it had a great staying power and lingered, scent unchanged even after 7 hours at work. 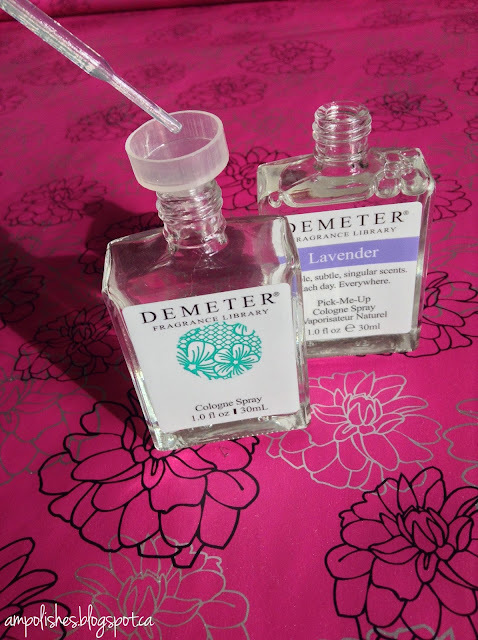 The funnel and droppers really helped me control the amount of liquid going into the empty bottle which is great when you want to add a small hint of one scent. I was glad there were four droppers because I was a little rough and over zealous with the first one I used because it broke at the squeezy part on the top and I got perfume all over my fingers. 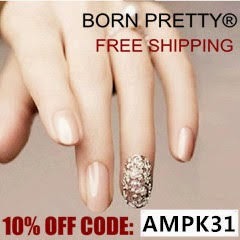 These DUO kits are $35 and are available nationwide and online. One additional limited edition FOOLPROOF BLENDING DUO will launch on Demeter's website monthly. I had loads of fun mixing my own custom scent and if you are a lover of perfumes and body sprays I think you would really enjoy these blending duo and trio kits. And what with Valentine's Day coming up, the gift of a beautiful scent would be a lovely gift idea.